Quotable Quote for the day is: Better than 90seconds! I awoke at 0430 EDT/0530 AT to the chirps of this little guy on the front stoop. Who knew it was warm enough to have cold-blooded reptiles up here. 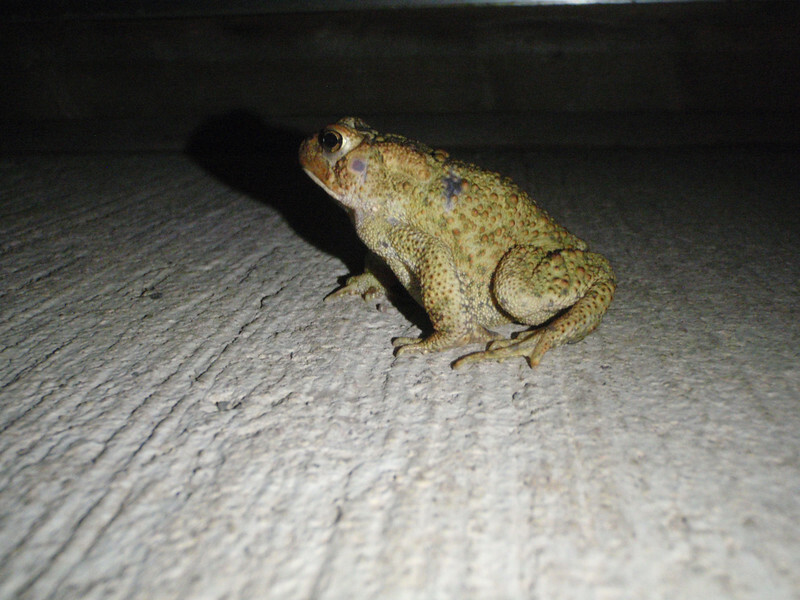 Since he's not a talking frog, he'll need to hop out of the way before we trample him. Each time will leave the staging team on 2 minute intervals. You will have exactly 12 hours from from starting time to complete, lest you become a victim of DNF. Those in late get rotton fruit thrown at them too, just for good measure. We'll not really, this was at a gas stop enroute! SInce the rally was fully supported with 3 sweep vehicles, as well as, command center watching the SPOT trackers I can understand that the volunteers can't be up all night. However, on the other hand, I would have liked perhaps not to have a time constraint other than the one that mother nature imposes on by fading to moonlight. The track has been well explained, or so I felt like as I left the staging area. However, the first turn there are bikes coming at us from all directions. It seems that some have overshot the first turn, and some riders have decided to ride the track backwards . The fog is so thick that you can't see much, in fact I wonder if it's not raining. 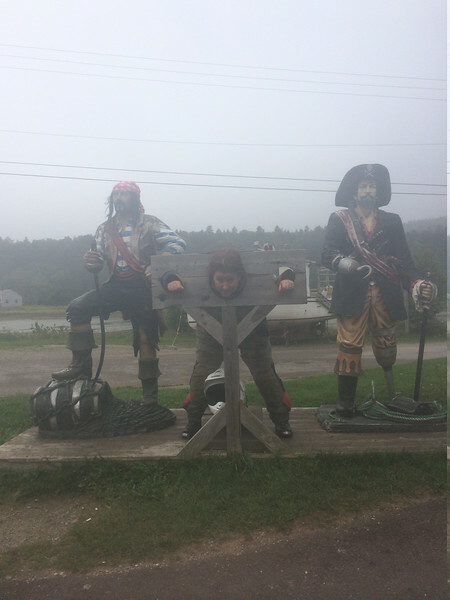 Such a shame becuase we rode the Fundy Trailway an hour before the park officially opens for the day. In any other conditions, it might have rode like a private racecourse. Today however, it's almost a slip and slide with the twisty, wet roads. The only good thing there is no guilt about losing time to take some iconic photos. The photos today would be as interesting as crossing your eyes. Since originally it was just Blaster and I by the closing date, we elected to ride under the moniker "Blastoff Adventures", instead of SoMD Adventure Riders. Keith was a late add, he will ride under the same monkier. However, he doesn't realize that he has to pay every time his wheels get wet! Our ride plan doesn't vary much for this trip. Smooth is fast. We'll set a reasonable pace, take a few well placed breaks. The bikes are fully gased up, and we'll only need one gas stop to get us home. We'll try each alternate, and if need be, double back to green/basic track if it gets too hard. I don't know why we even say that becuase we never doubleback. Somehow it seems too much like a challenge, and a challenge must be conquered. 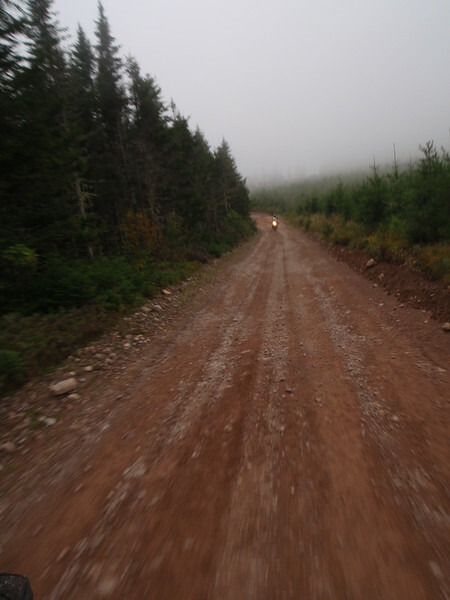 The first alternate starts off somewhat challenging with a mile or so of loose, peach sized gravel. Then we approach the most ugly, rotten bridge you've ever seen. I stop to watch Blaster cross it. In horror, the boards buckle and crack under the weight of his hippotomus-sized HP2. Keith, elects to ride a line closer to the outside of the bridge, and there was less buckling. I elect to get off and walk the bike over Keiths' line. However, now my human needs to leap about 45" to the next rail and not drop the bike. Luckliy, with a quick tug from the front of the bike from a helping hand...the XC-A daintly crosses. Soon enough, we are back at base camp where they confirm SPOT has been tracking and wish us well for the rest of the day.